1. Why did Lydia begin to feel unnecessary as wife and mother? “The house is wife and mother now, and nursemaid. 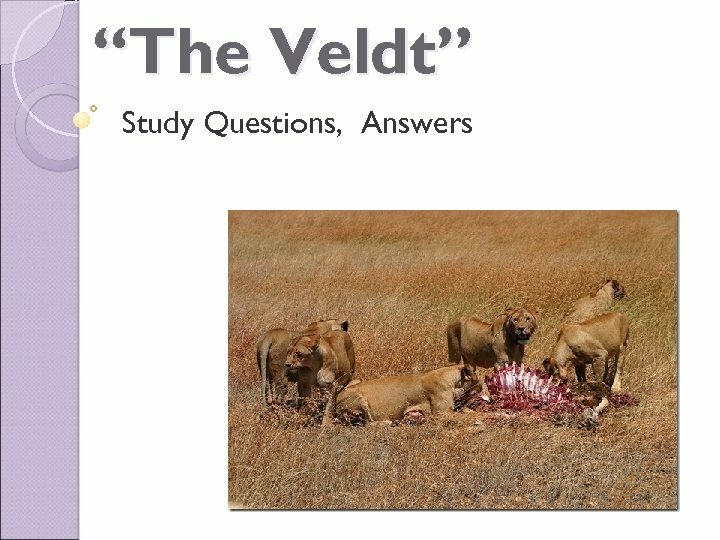 Can I compete with an African veldt? 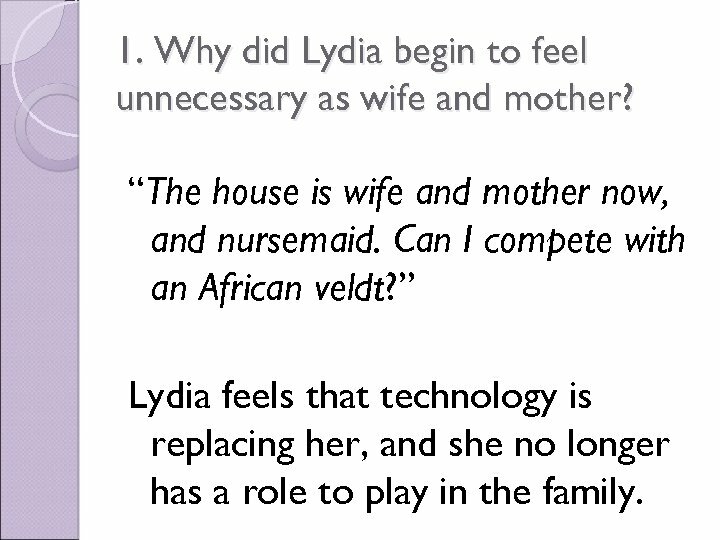 ” Lydia feels that technology is replacing her, and she no longer has a role to play in the family. 2. What is one specific way the Hadley’s continued to spoil their children even after they realized that there was something wrong with the nursery? “They’ve broken into the nursery. ” Even though the children have broken into the nursery when their parents locked it, there was no punishment for them. This spoiled the children. 3. 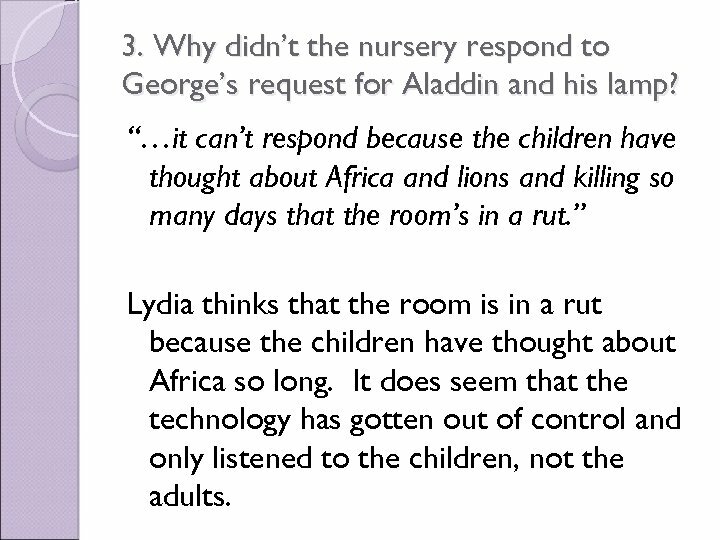 Why didn’t the nursery respond to George’s request for Aladdin and his lamp? “…it can’t respond because the children have thought about Africa and lions and killing so many days that the room’s in a rut. ” Lydia thinks that the room is in a rut because the children have thought about Africa so long. It does seem that the technology has gotten out of control and only listened to the children, not the adults. 4. 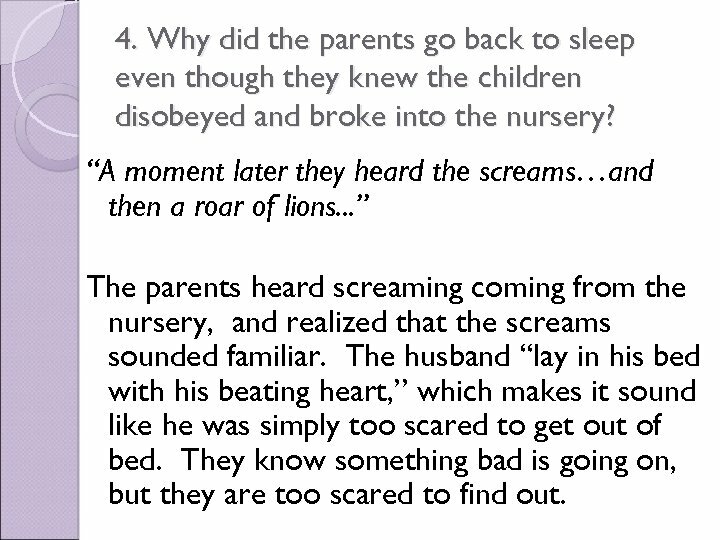 Why did the parents go back to sleep even though they knew the children disobeyed and broke into the nursery? “A moment later they heard the screams…and then a roar of lions. . . ” The parents heard screaming coming from the nursery, and realized that the screams sounded familiar. The husband “lay in his bed with his beating heart, ” which makes it sound like he was simply too scared to get out of bed. They know something bad is going on, but they are too scared to find out. 5. 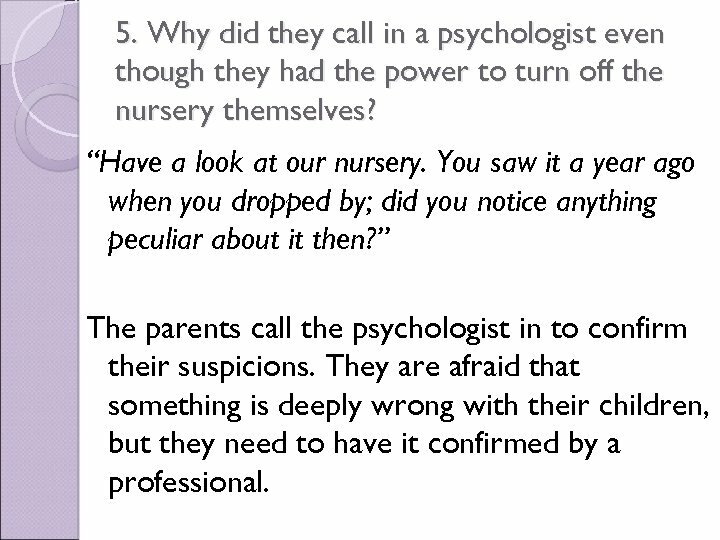 Why did they call in a psychologist even though they had the power to turn off the nursery themselves? “Have a look at our nursery. You saw it a year ago when you dropped by; did you notice anything peculiar about it then? ” The parents call the psychologist in to confirm their suspicions. They are afraid that something is deeply wrong with their children, but they need to have it confirmed by a professional. 6. Why did Mrs. Hadley, who had been so frightened of the nursery, urge George to let the kids have it on for one last time? “Oh, George, ” said the wife, “it can’t hurt. 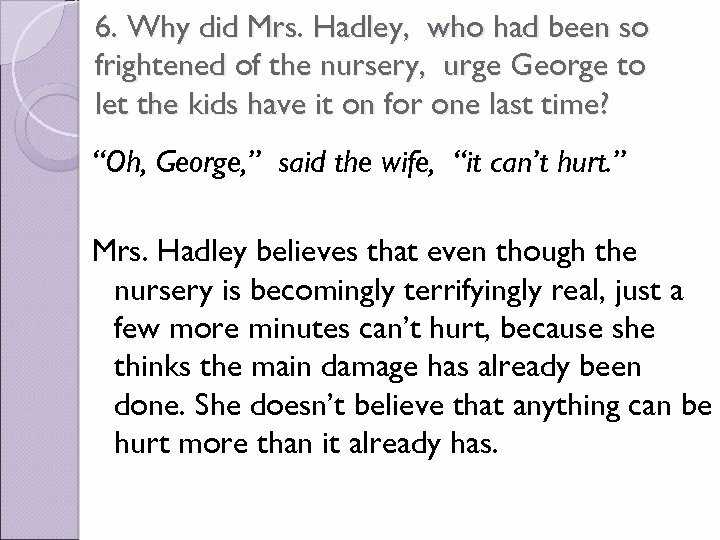 ” Mrs. Hadley believes that even though the nursery is becomingly terrifyingly real, just a few more minutes can’t hurt, because she thinks the main damage has already been done. She doesn’t believe that anything can be hurt more than it already has. 7. 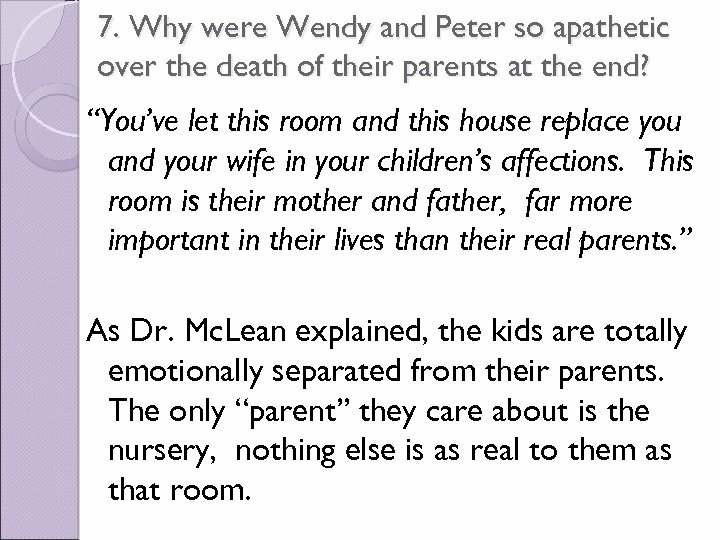 Why were Wendy and Peter so apathetic over the death of their parents at the end? “You’ve let this room and this house replace you and your wife in your children’s affections. This room is their mother and father, far more important in their lives than their real parents. ” As Dr. Mc. Lean explained, the kids are totally emotionally separated from their parents. The only “parent” they care about is the nursery, nothing else is as real to them as that room. 8. What were some of the mistakes the parents made in raising their children? “We’ve given the children everything they ever wanted. Is this our reward—secrecy, disobedience? They come and go when they like; they treat us as if we were offspring. ” The parents made the mistake of thinking that spending a lot of money on their kids and giving them everything were the most important things. They created spoiled, selfish children because they never said “no” to the kids.